"I started off in Revolution Bars which taught me the bartending basics but really taught me how to run a business. I went from there to being the GM of the LEGENDARY Portobello Star before its sad demise. From there it was onto its sister bar The Distillery, where I decided I was bored of management and decided to get back to bartending. 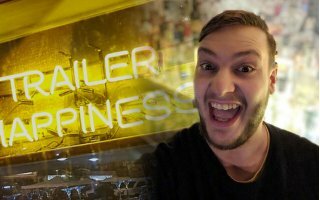 A position opened at one of my fave bars in the world so here I am at Trailer Happiness." What do you as a mixologist think about beer? Any brews of note for you? There’s nothing better than a cold beer on a hot day! I prefer anything generic and flavourless in that case however if I’m ordering in a bar I go for something a bit different. Highwire do a fantastic Grapefruit IPA. ALWAYS smile! Your job is to sell happiness! Keep learning, you can never know too much. Make friends with your neighbourhood bars, they will give you blue roll when you need it most!! Surely you hav0e some pet peeves about bartenders -- care to share? I can’t stand pretentious people or people who make others feel small because they think they are better. This is annoyingly prevalent in our industry. As a mixologist/consultant, you work directly with many restaurants on their drink menus -- describe the parts of this process. I always come up with a concept to work around and set you parameters whether it be a flavour/feeling/country/song… anything. It really helps to focus your ideas. Barbacking of course! Or glass collecting to be more precise in Revolution Brighton. Very corporate, company training on specifically menu drinks, no classics no spirit training just the very basics of jigger work and specs. What are some trends you're seeing in the market? I think low ABV is becoming a real trend, people are starting to want something a little less boozy on a night out. What's your process for creating a new cocktail? And what inspired you in the first place? As above really focus on a concept I want to build the drink around, drinks are better with stories. What is your favourite cocktail To make? I’ve only fairly recently started free pouring properly so anything with multiple bottle pours are fun. The Rum Runner at Trailer has a 4 bottle pour that always makes you feel like a G.
People more knowledgeable than me! I love going to tastings and trainings as much as possible. No idea haha! Nothing grandiose, being happy and making other people the same way. What are some current trends you’ve seen in the cocktail market? Again Low or No ABV, Kombucha as well is blowing up. Hopefully running a sick bar somewhere! Somewhere near a beach. If you weren't in the drinks industry, what do you think you would be doing now? I think maybe teaching, I always wanted to give that a go. I really looked up to my first GM Andy Spratt, he was 6’8. Milk? Nah I dunno, I remember trying my Dad’s generic Belgian stubby in the South of France. We've all had a bad experience with at least one drink. What drink do you most avoid? Can’t really deal with Sambucca, too sweet and too shoddy. Lucozade, breakfast (if you can stomach it) or failing that, Rum. £10m comes to you. What do you do next? Sort my parents out with something nice then buy a big house. Bar or cellar at home? Too many to choose… Rivers Rum from Grenada is up there at the moment. MAM has the best chicken wings in London, hands down. West Coast of Scotland. Gairloch is perfect. Holes! Or In Cold Blood – Truman Capote. Silent Alarm – Bloc Party.